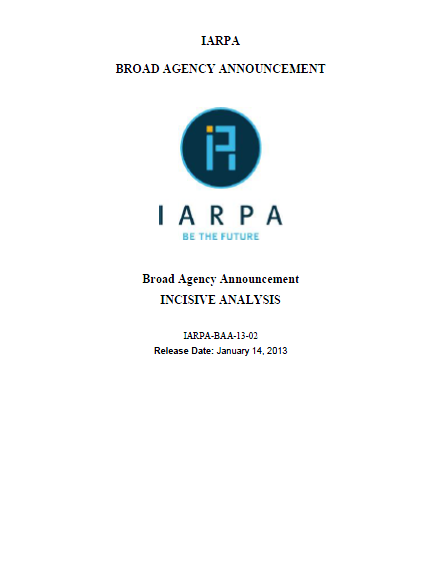 The following broad agency announcement was posted January 14, 2013 on the Federal Business Opportunities website. For more information on the solicitation, see Kade Ellis’ article for the ACLU of Massachusetts. IA focuses on maximizing insights from the massive, disparate, unreliable and dynamic data that are – or could be – available to analysts, in a timely manner. We are pursuing new sources of information from existing and novel data, and developing innovative techniques that can be utilized in the processes of analysis. IA programs are in diverse technical disciplines, but have common features: (a) Create technologies that can earn the trust of the analyst user by providing the reasoning for results; (b) Address data uncertainty and provenance explicitly. Methods and approaches to quantifiable representations of uncertainty simultaneously accounting for multiple types of uncertainty. This announcement seeks research ideas for topics that are not addressed by emerging or ongoing IARPA programs or other published IARPA solicitations. It is primarily, but not solely, intended for early stage research that may lead to larger, focused programs through a separate BAA in the future, so periods of performance will generally not exceed 12 months. Offerors should demonstrate that their proposed effort has the potential to make revolutionary, rather than incremental, improvements to intelligence capabilities. Research that primarily results in evolutionary improvement to the existing state of practice is specifically excluded.